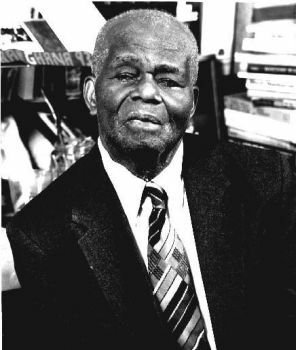 John Henrik Clarke, historian, black nationalist, and Pan-Africanist, was a pioneer in the formation of Africana studies in the United States. Principally a self-trained historian, Clarke dedicated his life to correcting what he argued was the prevailing view that people of Africa and of African decent had no history worthy of study. Over the span of his career Clarke became one of the most respected historians of African and African American history. Clarke was born on New Year’s Day, 1915, in Union Springs, Alabama. He described his father as a “brooding, landless sharecropper,” who struggled to earn enough money to purchase his own farm, and his mother as a domestic. Clarke’s mother Willie Ella (Mays) Clarke died in 1922, when he was about seven years old. In 1932 Clarke left the South at age eighteen and he traveled by boxcar to Chicago, Illinois. He then migrated to New York City, New York where he came under the tutelage of noted scholar Arthur A. Schomburg. While in New York City’s Harlem, Clarke undertook the study of Africa, studying its history while working full time. In 1949 the New School for Social Research asked Clarke to teach courses in a newly created African Studies Center. Nineteen years later Clarke founded the African Heritage Studies Association in 1968, and was principally responsible for the creation of the Black and Puerto Rican Studies Department at Hunter College in New York City. He later lectured at Cornell University as a distinguished visiting Professor of African history. Clarke’s numerous works include A New Approach to African History (1967), African People in World History (1993), and The Boy Who Painted Jesus Black (1975). He died in New York City in 1998. John Henrik Clarke, “Portrait of a Liberation Scholar;” Henrik Clarke, in Kwame Anthony Appiah and Henry Louis Gates, Africana (New York, Basic Civitas Books, 1999); http://africana.library.cornell.edu/.